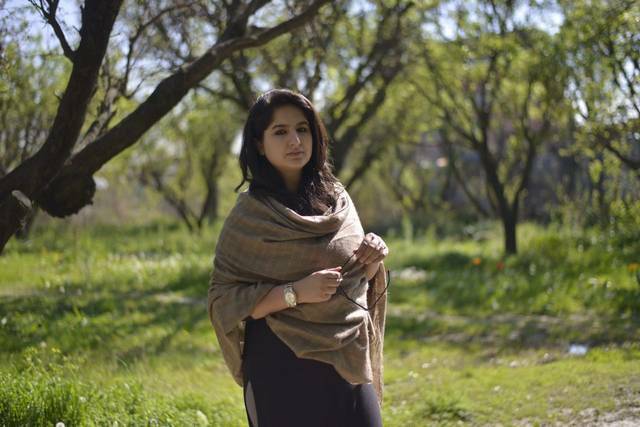 Gyawun talks to Iqra Ahmad, a young entrepreneur whose passion, hard work and grit has led her to start Palav—Kashmiri for “clothes”—a mail-order business that makes Kashmiri clothes with a twist. Here, she talks to us about her journey to get Palav off the ground, the integral role that social media plays in her trade and the ideas that drive her business. My name is Iqra Ahmad and I am from Sanat Nagar, Kashmir. I did my schooling from Dr. AGM’s City School and studied Economics, Psychology and Education from Women’s College, M.A road, Srinagar. I then did a Masters in Linguistics form Kashmir University, Dargah. I personally feel that I’m an outspoken person and I always believed in exploring myself and my surroundings. I have always been interested in fashion designing but never imagined opting for career in the field as such. I had many other career plans as well but none have worked out as well as Palav. I started Palav because I thought this is somethingthat I really wanted to do after giving a lot of thought on my career options.It turned out to be an online store because I didn’t have resources enough to invest in a physical store. 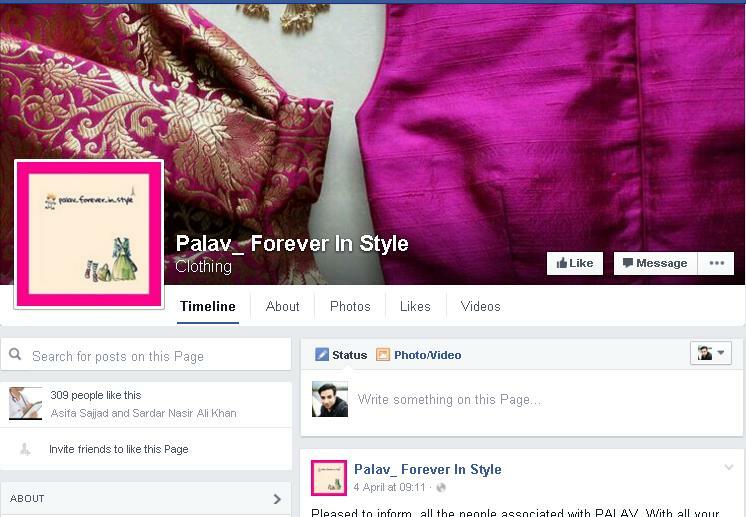 Therefore, Palav was born, and right now this online store where I display my products and sell them. We have many clothing products, starting with pherans(traditional Kashmiri tunics, for summer and winter wear), kurtas, pleated skirts, and tops and wedding dresses as well. We experiment with different ways of developing my products in better ways and make them unique and the materials are from within Srinagar and outside Jammu and Kashmir as well. We also have a personal app dedicated to Palav which can be accessed as a link, where products are listed depending on availability status. Once a product is sold, it is removed or highlighted as sold. Interested customers can directly contact me or get to me through the page itself. Once a new order is placed, I immediately work on it and provide relevant details about the product and its delivery. Then within the timeline offered, I make the product available through delivery agencies and sometimes my personal delivery mates whom I offer a reimbursement after some limited intervals. Customers have the liberty to check the product and if they don’t like it, the products can be returned there and then. The products can also be returned within a week time for re-fitting and other correctional reasons if required. Who is Palav aimed at? At the beginning, Palav,was just a small idea about how I perceived the clothes that people wear today. 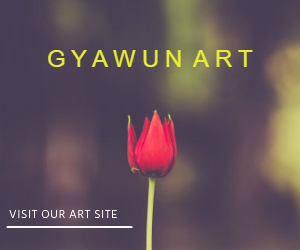 As I was gradually developing my idea, I started to realize that there was a greater purpose in it. This led to a bigger picture in terms of seeing it through. Palav today, is not just about a clothing trend that I am working on, rather it is a personal initiative to represent the culture I belong to. I wanted that my work should reflect the “Kashmiriyat” in what people wear and how they wear it. My designs are dedicated to all those women who find pride in who they are and believe in what they can become. I’m proud of being Kashmiri and Palav is my belief of becoming who I really am. How does Palav stand out against its competitors? I’ll not deny the fact that starting a new business is an overnight effort, especially when these days new business ideas are being repeatedly exploited, even if the ideas aren’t yours. Palav, for me was something that came naturally, and I felt deeply connected to the idea and it was easy for me to articulate it further. The name itself explains how it stands out against any competitors because understanding the need to preserve our identity and cultural is what Palav is all about. These are the values I intend to nurture with my work. My key product is the custom made pheran that was really appreciated and had a good response too. Looking to the future, I intend to bring more ideas to the table so that the business may go on. I understand the challenges ahead and have utmost appreciation for all the others who have come up will similar ideas to explore their own ideas.Palav will not be any online shopping store where you get any random branded product that you find these days. It is a personalized store where you get unique products. As I’ve mentioned, Palav is more like an initiative to represent and sustain the essence of Kashmiri culture and creating a trend along the way. It is definitely not just collection of tailored products but, for every product I put a lot of thought and try articulating my ideas to make something new and something that looks better by allowing for experimentation, a process that has turned out to be fruitful. I was appreciated for the taste of clothing that I had offered to the people so far. The only reason Palav is being recognized, because my products satisfy customers in many ways. It fits the definition of fashion that revolves in the valley. Modesty, comfort and confidence are what really defines the fashion in Kashmir. I’m just contributing a little towards understanding women and the way they want to be recognized in our society. Where did the idea for Palav come from? Palav is the idea I relate to because it is my window to the outside world and to articulate this to the rest is what my purpose is. Let it be just an idea, a business plan or a purposeful initiative. All this came to me from my outlook and channelising the energy into a meaningful direction. What is your business background, and what got you interested in Palav? My father is a lawyer, my mother is government employee and my brother is also a lawyer. Business was the last thing on my mind but my family has always been supportive in every step I decided to take. It took me a while to see this through. I would rather say, it took me a lot of time to decide what I really wanted to do in life and that is when I emerged with Palav. It not only cleared my confusion but also made me aware of what I’m good at. How did you initially raise funding for Palav? People always find this difficult to know that I started from a very little resources that I was able to invest in at the beginning, I did all the research and pilot study to understand the scope and simultaneously considered all the possibilities. I had a part time job even when I was studying so I had some savings to invest but that wasn’t enough. I took a leap of faith and started taking every step after another with hope and courage. I had a taste for fashion designing but have never had proper guidance to work in the required direction. This never let me down and I took more interest and put more effort to compete in a market where fashion designers are struggling to leave their mark. Finally, using social media was the ultimate solution to most of my problems. How long has Palavbeen in the making, and who is the team behind the business? Like I said, it took me some time to actually make things possible but, there was never a definite number of people working on it. I patiently worked upon everything one after another, while taking valuable insights and help from my family and friends. I’m extremely grateful to those who believed in me and gave their valuable contributions. Without them, Palav would not have gotten off the ground. Dreams can be achieved by believing in it and money isn’t the only criteria to start a viable business .Understanding and utilizing the knowledge about one’s environment is extremely important. This is the true essence of becoming an entrepreneur. What has been your biggest challenge you have faced so far? Challenges never end and they will keep showing up in from time to time. But keeping a good attitude is what really matters. I worked hard to get what I wanted and there is no shortcut to anything. Still, the most challenging time was to convince myself that I could do it. What has been Palavs biggest achievement? My definition of achievement is Palav itself. The beginning of this idea is what I dreamt about and today, it is being recognized for what it is. Still, I would also mention that I have gathered a large circle of customers who actively shop and appreciate products. So far, more than 200 products were sold just in the last month, most of them werepherans and products are being shipped also to Jammu and Delhi as well. Another milestone is the good wishes from customers, some who are from outside Kashmir. Palav, I believe is at budding stage and there is lot to achieve yet. 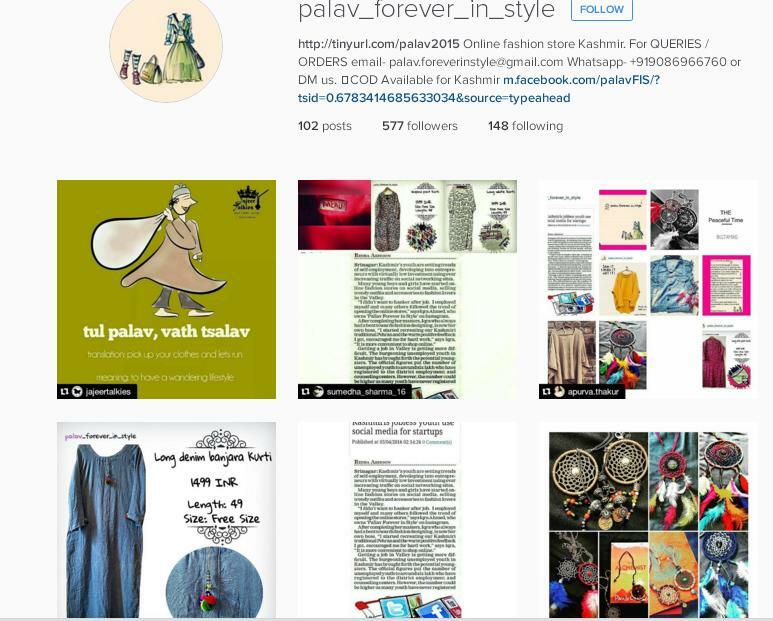 I only expect that Palav would continue growing and for people to see more than just an online store but as a symbol of pride for being a woman, a Kashmiri woman. Seeing the response of customers, Palav might grow into a physical store soon. Be original with your ideas and believe in what you can achieve.